If you are a small business and don't have a local search strategy you might be missing out on daily potential customers. Even worse if you don't know what ROI is, then you are not measuring your advertising budget at all. ROI - Return On Investment is defined as a performance measure used to evaluate the efficiency of an investment/advertising in this case or to compare the efficiency of a number of different investments to verify effectiveness and profits. With Google local search focusing more on geo-targeting, it has become the most effective way for marketing small to mid-size businesses in Los Angeles and other cities around the United States. With this geo-targeting focus comes tough challenges for small business owners who need to get their business in front of potential customers searching for a local solution. In most cases, small business owners have no idea how their business is doing online and if so, how they can grow organically while cutting their budgets for paid advertising. But with no way of checking ROI, they can't track their efforts to see if their investments are paying off. To start understanding your investment returns, you'll need to track all your digital marketing strategies with software solutions like Google analytics. A took a short survey from our subscribers and found a lot of troubling signals about how they run their campaigns and the results were not pleasant. Most small business owners actually have no clue what tools they use to run their campaigns, track conversions or analyze marketing data that can help them succeed. After this marketing survey was completed, I decided to share the some tips on how small business owners can improve their local search tracking and be able to analyze data and optimize their local business on search. How do you know who filled out a form on your website? You'll need to setup a form on your landing pages to collect potential customer data. In some cases, you might not be able to track a flow of leads to your sites - so instead change your strategy and include a call tracking number to track all calls that come from your local listings. To further improve you local search listings, you can track leads by including tag manager on the specific landing page. Using tag manager will help you check to see if your code was setup properly on your tracking forms. To learn more about lead form on your site, see "How to Create Awesome Lead Tracking Forms for Your Site"
As more and more technologies become available for tracking your marketing efforts, search engine traffic from advertising is the best option for local businesses. Call recording can help you track caller logs and also insights into calls that generate a lead or sale. This will help a small business owner know where to spend their marketing budget and receive the most calls and revenue. See more effective ways to track calls with call recording. Getting the right conversions that directly relate to sales and revenue can be bleak, if you don't have a system that tracks all data in one place. This happens a more often with local SEO campaigns, because revenue and CRM data are track on separate systems that are not integrated with digital marketing data, so you are always comparing milk to mango to cake. This results to derogated data that doesn't give you the insights needed to take action. Here are top 5 reasons to consolidate data. Reviews can improve you local search rank for keywords you target and also gives you a way to show off your past clients for a potential searcher to see. Start tracking your reviews and make sure to respond to every review, positive or negative. To better monitor you reviews and reply to comments right away - Download "Google My Business App" and get notifications when a customer reviews your business. When customers click on your listing and land on your pages, what's their intent? What keywords did they use to find your site and why? In order to answer these questions, you must first recognize your customer intent and make sure you are running campaigns on both organic and paid search. Start by looking at conversions with close customer intent. This will enable you to show up in search at various points of the sales funnel and solidify your product as the best choice. 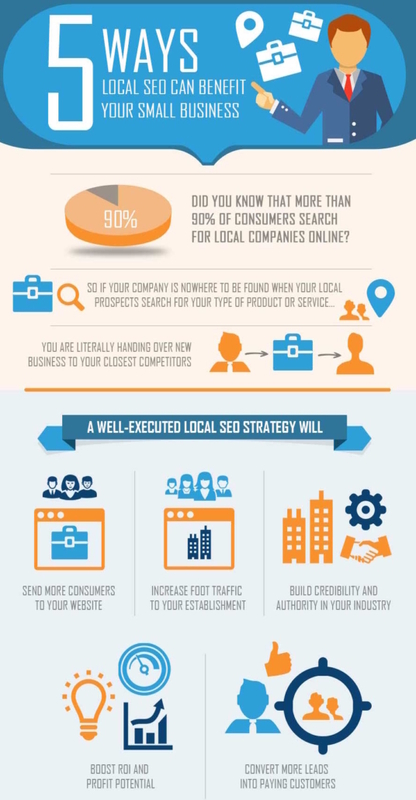 The reason for local search is simply to drive local customers who are searching for products and services you offer. With that in mind, tracking your local search traffic every month and year after year is a good way to understand your local search traffic growth. To track specific pages for local search, make sure to use UTM tracking codes to your google listing. This way of tracking will give you better insights as to what pages your local search traffic lands on. Once you are tracking this signals, you'll get a better understanding as to what drives traffic to your small business website. You can easily start seeing results with your local search campaigns today. To get started, get in touch with one of our SEO experts.